For standard-sized dryers, meaning dryers 36 inches or less in height and 27 inches or less in width, the FASG7074LN manufactured by Frigidaire boasts of having a capacity that is above average, so users can dry more loads of laundry in one go. There's no need to do one batch after another of laundry loads, which only result in a waste of time, resources and money. Moreover, there is an assurance of quiet operation with this machine without sacrificing performance, thanks to its SilentDesign package, a trademark feature in Frigidaire dryers. This model also has a built-in sensor that automatically adjusts the time and temperature to be applied to a load, resulting to items that are evenly dried. The interior tub of the dryer has a is resistant to rusting, corrosion, or chipping, which means that you are not only guaranteed a dryer that will last long and less prone to damage, you are also assured that no paint chips, rust discoloration or other bacteria will affect your laundry. 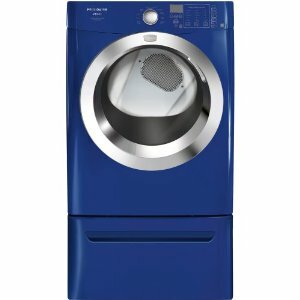 The 7.0 cubic feet capacity is also the largest for dryers for dryers of up to 37 inches tall and up to 27 inches wide. The built-in Ready Steam feature of the dryer is a trademark of Frigidaire, which when used, gently but effectively removes wrinkles and refreshes dried items. Users don't have to bear that stale, hot smell of dried items once they come out of this dryer, as Ready Steam reduces the need for heavy-duty ironing and air drying to rid of that metallic dry odor. Included in the control panel conveniently located on the top portion of the dryer's front face are Express-Select Controls, a trademark feature of Frigidaire which lets users select cycles and option in the easiest manner possible- with just one touch of a button. No complex combination, no hard button presses! The classic blue enamel finish of the dryer's exterior is a welcome sight for anyone who wants to see an elegant yet edgy-looking appliance. The DrySense Technology is this model's built-in moisture sensor that accurately and precisely decides when clothes are dry. With this feature, incidences of over and under-drying are prevented, and fabrics and better protected. The high temperature sanitary cycle is a great feature for users who are very particular about their clothes' cleanliness, as the feature effectively removes germs and bacteria from items, leaving them thoroughly clean. For those with a narrow or small laundry area, the reversible door is great help as the user can change the orientation of the door opening, whichever direction will be more suitable and convenient. The cost of this unit may be a bit too high for some shoppers, considering that it is steeper compared to other dryers with comparable features.